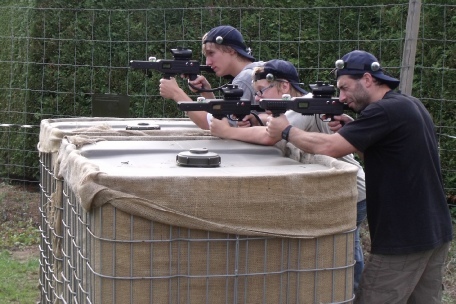 Wye Valley Warfare is brilliant for birthdays, with great games which will really bring you and your friends together. It also gives you an excuse for some outrageous military fancy dress! You learn how to use the taggers and listen to the safety talk. Then you’ll get your hands on one and move to the Battleground to start as soon as we can. There’s a quick briefing on the first game, then you are straight into the action within seconds. You’ll play about 6 to 10 high adrenalin games in the next two hours - so don’t have your birthday tea before you start or you’ll soon see it on the Battleground! You’ll play on the redoubt, in the Forward Operating Base, around the Logging Camp and the Farm, and your games will have a Special Operations twist. You can bring a picnic to eat afterwards, or make arrangements with the Tearoom Cafe on-site. We’ve teamed up with Symonds Yat Canoe Hire to offer a brilliant day for you and your friends - check out our brilliant canoe and laser tag package deal. We can take up to 24 players per session, and can arrange an exclusive session if you have 10 players. Please bear in mind that players must be at least 8 years old and non-players (including dogs) are not allowed on the Battleground.